We had our loft boarded by Anthony and I just wanted to say what a great job he did and how pleased we are. Anthony was lovely and polite and hard working. He took the time to explain the process and how everything worked. He was clean and tidy and we were very pleased he protected our new carpets with the plastic covering. 10% OFF - ENDS APRIL 30TH 2019 - HURRY!!! This is it, the last chance to get some money off. Book a survey before the end of April 2019 and we will give you 10% OFF your quote. It completely free to get a quote from one of our qualified loft storage surveyors. Look at what we have just been presented with! Safe Trader Award for excellent Customer Service! ONCE AGAIN! 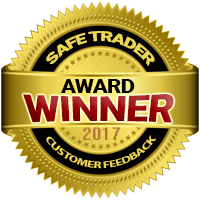 We have been selected as a winner for the Safe Trader Award 2018! This recognises our business for regularly collecting customers excellent feedback and having consistently high ratings! This wouldn't be possible WITHOUT YOU - our amazing customers - past, present and future! Thank you each and every one of you for your continued support! Here is to an amazing 2019! Well done to Aiden one of our approved installers. The service was excellent with no upfront payment. To fit the hatchway the fitter had to modify some existing plaster coving, which was expertly done. 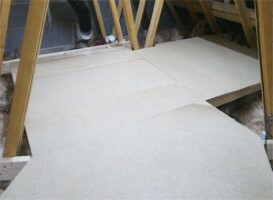 The fitter laid floor covering over flooring, this covered from entry to house up the stairs and work-site on landing. Would you like a quote to professionally covert you loft in to a storage area? or visit loft-boarding.com to enquiry online. We are delighted to have received notification that we have won an award, through Safe Trader Scheme!! From the information collated on our company and our websites, we have been given the Customer Feedback 2017 award! This means that they recognise Loft Boarding NW for regularly collecting feedback from customers, with consistently high ratings. Thank you to all our wonderful customers - past, present and future - for all your lovely reviews! We pride ourselves on providing quality workmanship, and this award is amongst one of the many ways to prove that! Why not cash in and up-sell professional BBA approved raised loft storage systems that do not compromise the NHBC guarantee. 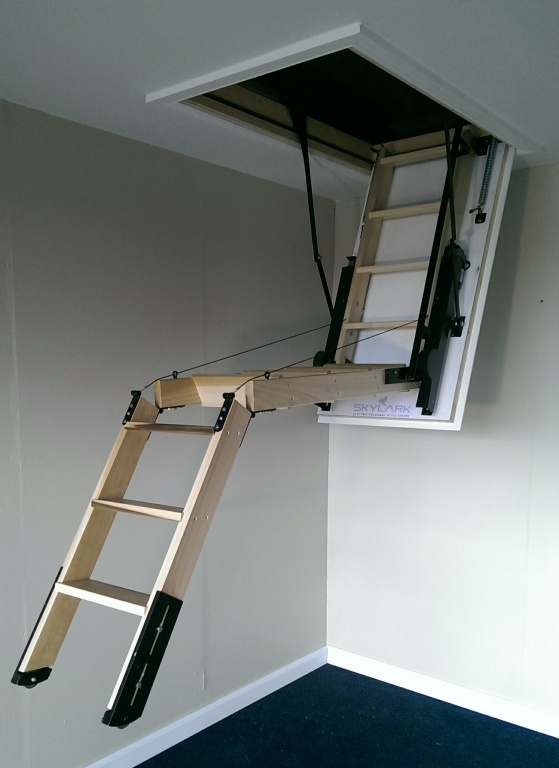 We can solve your clients storage problems very easily by providing a retractable loft ladder, lighting and raised above the insulation Loft storage using a unique and BBA approved loft storage system. You do not have to remove or squash the insulation to create a loft storage area anymore. Loft Boarding NW Ltd in conjunction with LoftZone is a manufacturer approved raised loft floor installer and have completed 1000s of installation throughout the North of England. This product consists of three main components to construct a raised platform over the loft insulation level without compromising the air flow in and around the loft or storage area. It is unique because there is no other BBA approved loft storage system on the market and it's very strong and quick to have installed. As a home builder you have probably been asked many times about loft storage, well why lose out on an opportunity to cash in on this very busy time for new home building? What we propose to offer to all home builders/developers is a free sample of what we offer, installed in a show home or site in the Northwest, South or West Yorkshire. This can be used to showcase what can be offered to new home buyers as an additional extra. Packages can be made with simple pricing to offer your clients and we give a 5-year guarantee with all our work. 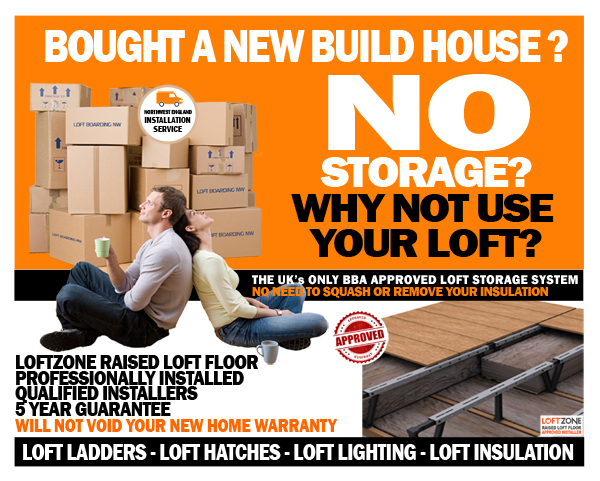 Loft Boarding NW Ltd are the largest installer of approved loft storage systems in the North of England and continue to expand in to other areas. If you are a home builder/developer and you would like to talk further about what we can offer to help your client solve their home storage problems please call us on 01254 370073. Remember we offer to install a FREE sample including ladder light and raised boarding using the existing hatch which your new build will most likely have already. Time for celebrations here at the office today! 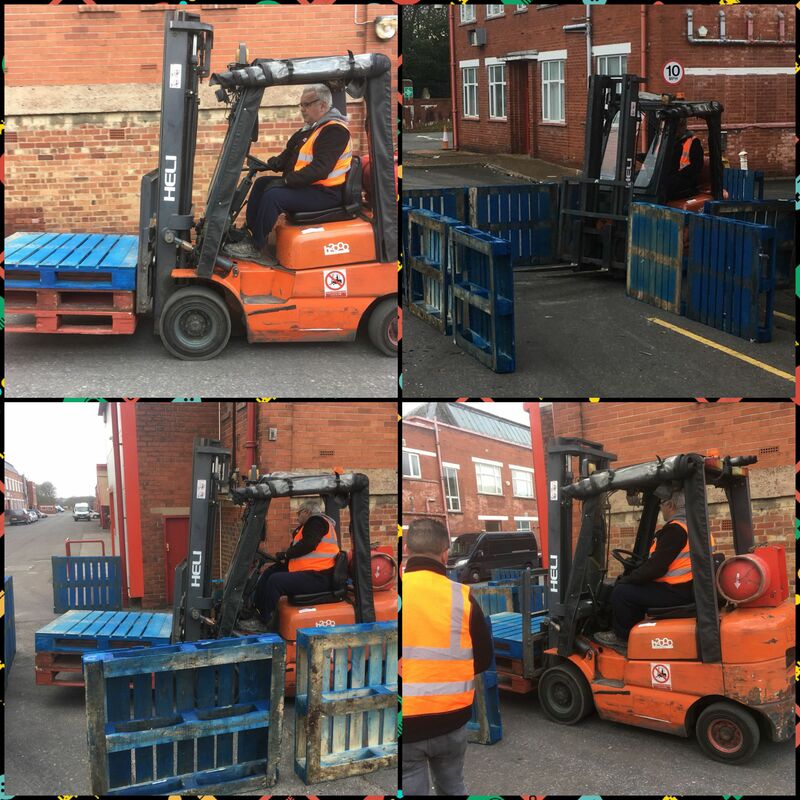 Andrew Greenhalgh (M.D) and Christopher Beresford (Sales Manager) have successfully passed their tri-annual Forklift Counterbalance training/exam today, with flying colours! Congratulations to the both of you! We love to keep our staff up to date on all the latest techniques here at LBNW, in order to provide our customers with the best service possible! We would like to give a huge shout out and thank you to Steve Thompson at SDT Forklift Training! If anyone is in need of an update on their FLT knowledge, you should 100% contact this guy! 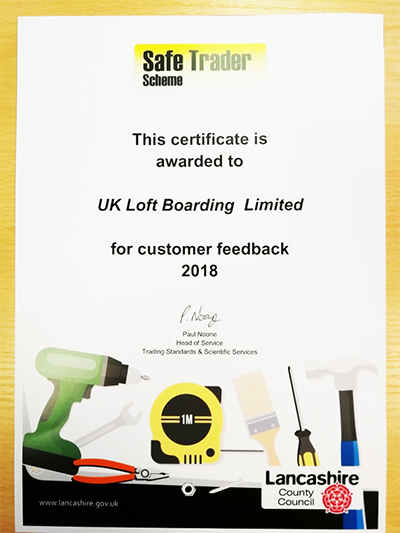 Well, we have just completed our training day last week for another year at Loft Boarding NW. It was snowing quite a bit and thought we might have to postpone for a later date. We all managed to get in - well, all but one, but he had just become a new dad! Congrats Anthony. So this year we had a talk and demonstration by Ben from Total Transits who maintains our fleet of work vans. We are big on preventative maintenance. Thank you, Ben. 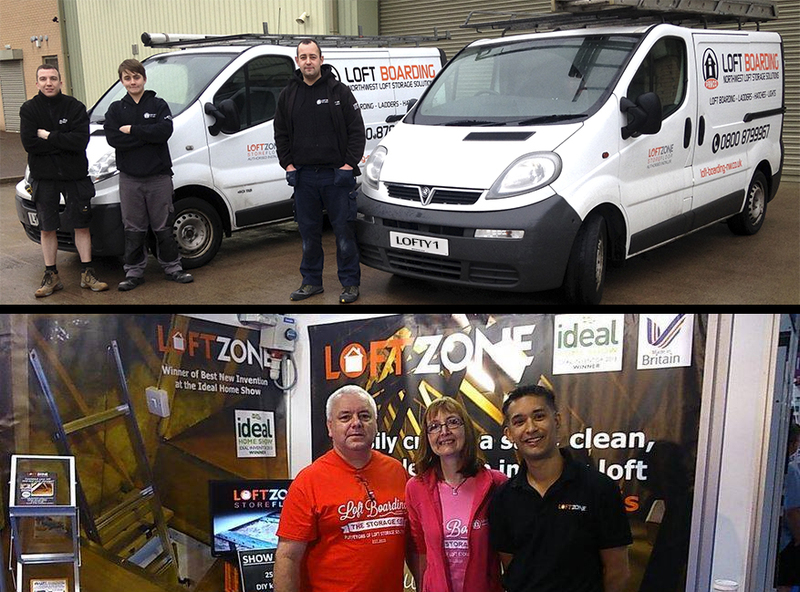 We also had a visit from Dave Raval, the CEO of LoftZone, one of our main suppliers. He talked about how this amazing loft floor raising product (StoreFloor) actually came about. Very interesting, and I loved to hear that it all started with a conversation in the pub whilst having a pint. That's where most of the best ideas start from! I think all the staff enjoyed their lunch of bacon and sausage butties and cakes. They get spoilt, honestly! Its great to all get together and have a chat, learn about new things. It's important that as a company grows, there is some sort of "getting together" at the office, as its really hard to get everyone together in the one place during our working week. I'm a big believer in training and making sure we are all working from the same page of the book. This is how my business has succeeded because we don't ignore employees training needs, we are always ready to help our staff to get the most out of their job so they have the best knowledge and skills that are required to do a job correctly. Well that's that for another year, well done all involved. Again, we are a bit late in updating you all! But in November, we expanded our team again. We would like to welcome Amy and Paul to our ever growing team! Amy is our new Sales and Marketing Executive in the office, and will be handling calls to and from customers along with booking your install/survey dates and looking after our social media pages. Paul is our newest trainee installer to join us, and is currently undertaking a 6-8 week training period. He will be out and about with the lads, helping to carry out various loft boarding jobs and learning as he goes along. 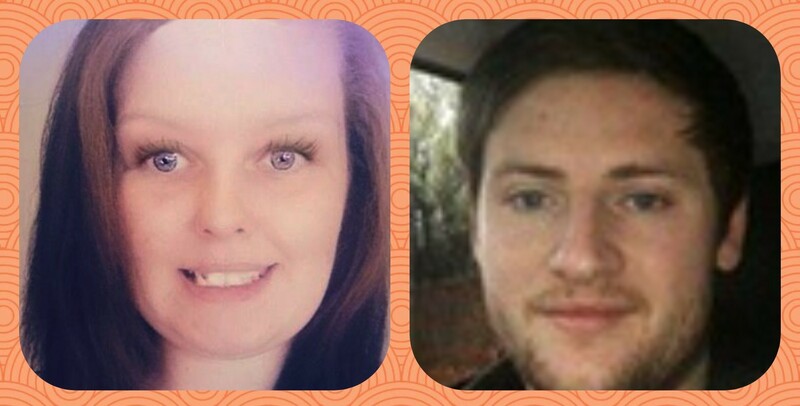 We are very proud of our team here at Loft Boarding NW, and feel that both Amy and Paul will thrive and progress within the company. 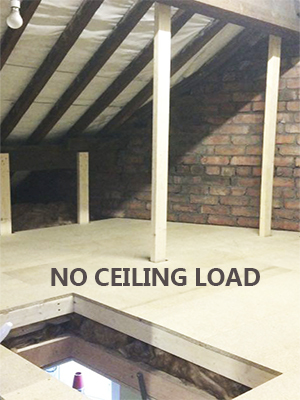 Don't risk using your loft for storage without having it professionally boarded first! This is the time of year when everyone starts to get out their Christmas trees and decorations and spend a weekend titivating their homes in preparation for the festive season. The first job is to dig out those step ladders from the garage and set them up so you can access your loft. Now you are starting to realise how much hassle this is going to be once again, as the memories from last years performance of getting in and out of the loft safely, begin to appear. Reaching up, climbing on the door architrave and heaving yourself into the loft off the very short step ladders is just the first obstacle. Now you need a light so you can see what you are doing up there. Realising you have no batteries so have to climb down again and nip to the shop to get some. Once you are finally in the loft, you have to walk around like you are trying to avoid stepping on something you shouldn't, or should I say stepping on somewhere you shouldn't. You know it! One slip, one missed footing and through the ceiling you go. Not what you need at this time of year. Hours and hours in casualty and then crutches for the next few months, or worse still, hospitalised. Why struggle? Why risk it? Loft Boarding NW can create a safe, strong, easily accessible loft storage solution in no time at all and, from as little as £350 all in. Yes okay, there are people advertising on Facebook, lamp posts, leaflets through the door who can hopefully do this service for just a couple of hundred quid. We know, and we also know what they have to leave out, cut corners on, just to give you those underestimated prices. If you are going to have your loft boarded, get it done by a professional company whose installers are qualified, insured and are a company who specialise in this field. Don't choose (in it for the beer money) cowboys. Incorrectly boarding your loft could be very dangerous and most importantly, will destroy your energy rating to less than a quarter. Some things you buy can be cheaper than others, but when you are dealing with creating a safe strong platform in your loft over a very delicate ceiling, you cannot cut corners. Its one hell of a fall if you go through, and the cost of repair is expensive. You don't need this anytime of the year, let alone at Christmas. A LOFT storage expert is expanding its workforce as it moves into much larger premises. Loft Boarding NW, of Junction 7 Business Park in Clayton-le-Moors, is interviewing as it starts to settle into its new 4,000 sq ft base, which is four times bigger than its current home on the same estate. The loft storage company specialist was formed in 2009 as a maintenance company. It now employs 16 people. Loft Boarding NW is run by Mr Greenhalgh and his wife Andrea. They saw a gap in the market for a quality loft storage specialist and initially ran the business from a tiny bedroom. Last year it became a limited company that now operates from offices and a warehouse. Loft Boarding NW provides energy-efficient loft storage solutions. Besides specialising in loft storage and insulation, it installs the most energy-efficient loft hatches combined with top- quality loft access ladders. Since 2010 the area of coverage for Loft Boarding NW has grown considerably and it now covers about 90 per cent of the North West. It is also expanding into Yorkshire. Mr Greenhalgh said he was particularly seeking to employ electricians. He said: “It’s all go at the moment. We haven’t had the room to swing a cat really and we have a lot of work to do at the new place. “It’s difficult to say how many more people we will need because we are continually advertising. We fill roles but the demand is still there. As for the expansion into Yorkshire, Mr Greenhalgh said he was targeting the west and the south of the county. He said: “We will dip our toe into the water and see what response we get from the website. Can I cover fire rated ceiling down-lights with loft insulation? It is important to assess the energy efficiency of your home, and the best way to make the most of it, is to take measures to insulate your home correctly. Getting the right amount of insulation in your loft space is the first step to saving energy, which will ultimately save you money on your fuel bills. The government now recommend 270mm+ of loft insulation. This may cause a problem in some lofts that have down-lights fitted in the ceiling. You cannot cover these down-lights, even if they are fire rated. All electrical lighting, especially in a loft, requires some form of ventilation. So it's important that these lights are not covered with insulation, unless a vented box has been fitted over the light to allow air circulation. Sorry for another late post! But we have been very busy at Loft Boarding this year and getting some news out on the site has been almost impossible to get around to. But here we go. 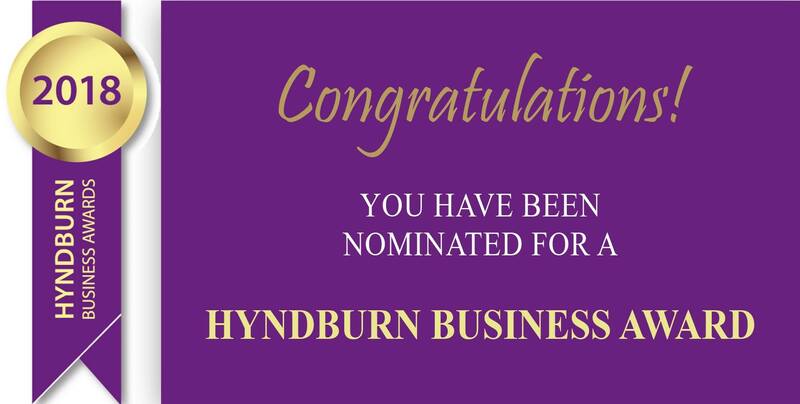 We found out in May we had been chosen as a finalist for the Hyndburn Business Awards 2017. We were so happy to hear this news, as our loft boarding staff have done really well this year! Helping our business grow into the largest approved loft storage solutions installer in the North - if not the UK! We attended the awards at Accrington Town Hall, which was such a brilliant event. Great food, lots of local businesses attending, we loved seeing the buzz of the place. Loft Boarding were directors in attendance, hoping to receive an award and generally having a great time. Unfortunately, we were pipped to the post by a joint first with Whewells and Devlan office furniture. Well done to two top local companies. We will have another go next year, and will be seeing everyone again for the 2018 awards. Well done all who won an award, it's a great achievement for Hyndburn businesses. I've been doing a bit of research on storage options recently. Self storage is big business at the moment, which is great as its telling me that we are keeping more stuff and throwing less away. Okay, some people would say its junk, but I disagree. Why not up-cycle? Save the baby toys for the next little addition. I think we are now realising that we have to do something to help the planet and stop throwing so much stuff away when really, its not finished with, worn out or even classed as junk yet. I once stopped a customer who was about to throw a laser printer into a skip. It only needed a new cartridge, which cost me just £15. Plenty cheaper than a new printer costing £90. I put it down to becoming a throwaway society. hHaving that disposable income to be able to just simply replace things if they no longer fit the decor or because you want the latest model. In my job, I see a lot of stuff people keep in their lofts. Like baby clothes, accessories, hardly used or unopened toys, xmas gifts, books, collectables, family heirlooms and so on. Anyway moving on. So what did I discover when comparing self storage with what I do, loft storage. That's where I was quite shocked that people were paying this amount long term. The average renter-of self storage hangs on to a unit for around 3 months, and a good proportion never empty them completely and keep them for longer. Especially when moving home. Some how all the stuff doesn't fit in their new home, but they don't want to get rid of it. Understandable, why would you put it in storage, pay all that money and then decide months later you don't really need it! So, what is the alternative? Well it's the reason I am in the storage business. Because I saw the trend of storing things & keeping hold of things was growing, I wanted a piece of the action and decided to open Loft Boarding NW in 2010. I wanted to specialise in home storage, and became the largest loft storage installer in the North of England. Utilise your home's natural wasted space by converting your unused, unloved loft into a clean, pleasant, safe, accessible storage area. All you need is good loft access by having a suitable loft door installed, a decent quality ladder you can leave stored in your loft, some energy efficient lighting, and a safe strong platform to walk and store on. Now, you see where I am going with this one? So what does it cost to board out a loft for storage? Well, there is no average cost because every loft is different. Some small, some huge. Some need special access ladders and hatches etc. So lets base this cost on the average newly built house that has a new loft hatch, so just requires a ladder, lighting and some raised boarding, say 100 sq ft. So what will that cost to install? Everything all in, £546 and that's costing you only £10.50 a week, compared to £35 for the same amount of storage space at a self store unit. And its right above your head; safe, secure and easily accessible when you need something. Having your own home storage means you don't have to panic if you miss paying your unit rent and find a padlock slapped on your unit, so you cant get in unless you pay up. Most of the time they have made an error by not sending you the bill to remind you on time. A lot of these places employ people on minimum wages, with barely enough skills and training. They are left with the major responsibility - most of the time - of running these places and they have no idea what they are doing. (That's from experience some time ago). So maybe I am biased, but the facts speak for themselves. It's far cheaper to convert your own loft to use for storage than to pay for self storage. It's more convenient and once you have bought and paid for it, there's not a single penny of rent to pay anyone. Obviously, you can't put a motorbike up there, but that's what a garage is for - unless that's jammed full as well! Just one more thing, there are even some people out there who actually rent part of their loft to other people, for them to store in. So you could even get your money back in time! That's FREE storage for life. Think on! 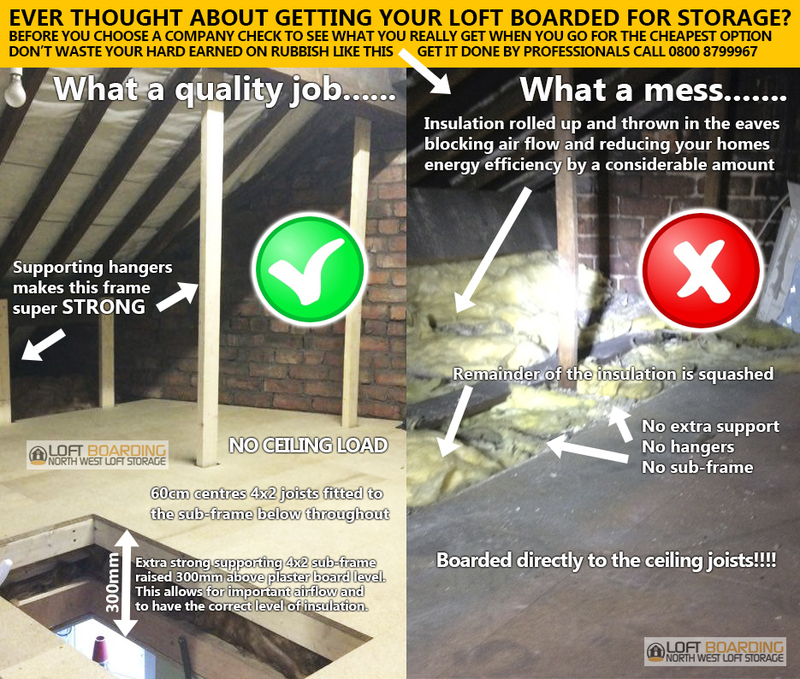 Now you can see the real difference between quality loft boarding and cheap loft boarding! This is not new news, by far. 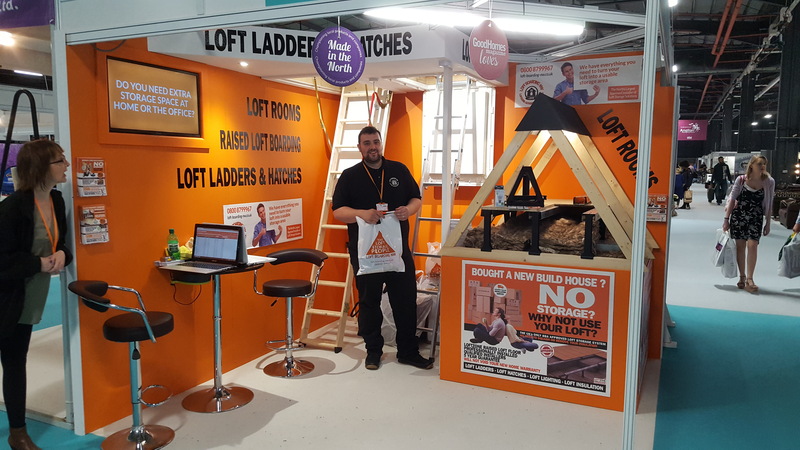 It's a fact that Loft Boarding NW Ltd have been fitting quality loft boarding and storage systems for over 6 years now, setting the bar very high for the competition. With their unique sub-frame systems, which add strength and height to the loft storage floor area to allow the all important air flow in the loft, which will allow your insulation to do its job in the most energy efficient way possible. There are, unfortunately, some bad loft boarding companies out there. Claiming to do a professional job when they simply cut corners to compete on price, which means they have to cut back on materials and quality. All sounds a bit OTT? No, not at all. The rules are the same for loft boarding companies as they are for a building company. 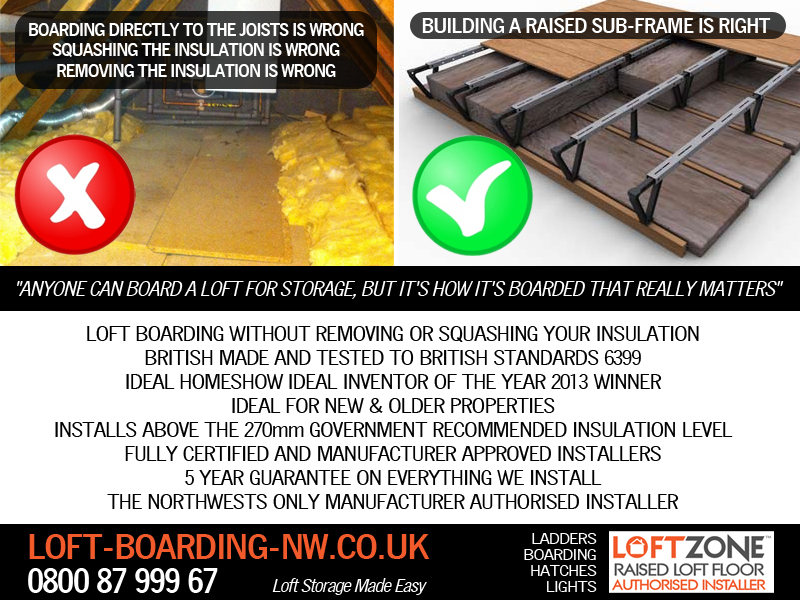 Loft Boarding NW always consider the storage load and the sub-frame load. In an older house with weaker ceiling joists the sub-frame for the boarding must not only be raised above the insulation, it must also be installed in a way that it does not put any load on the existing ceiling. Loft Boarding NW Ltd specialise in these methods, so you know you are getting a well produced job in accordance with any regulations there maybe. 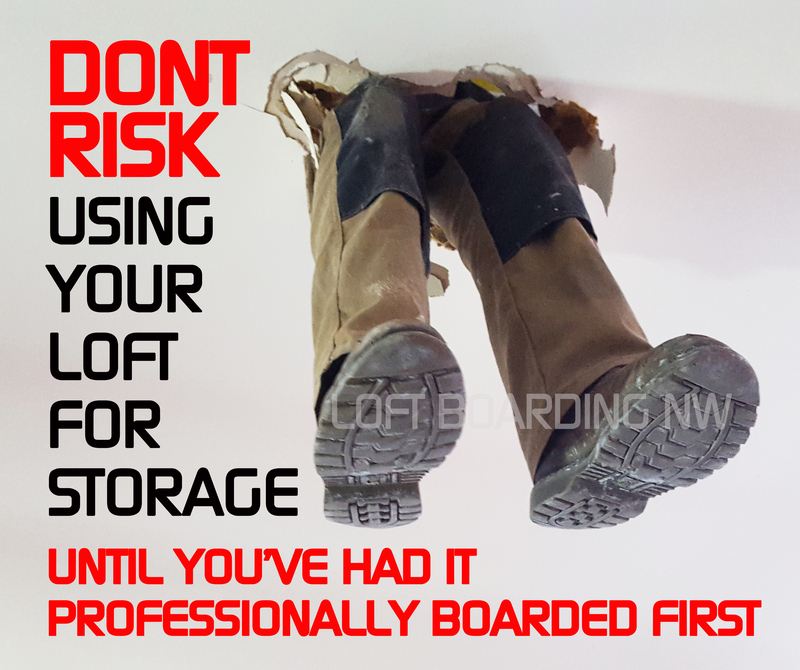 To find out more, visit the experts in loft boarding. Yes, we can now have manufactured, semi-automated, quality made timber loft ladders to suit the exact measurements of your home. 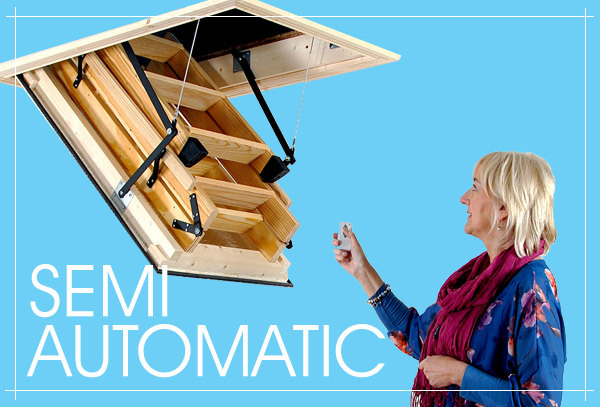 If you are finding it a little harder these days to get in your loft, then why not invest in a state of the art remote controlled semi automated loft hatch. You no longer have to reach up or climb on a chair to unlock your hatch, you can now simply press a remote control and the door opens automatically, so you can fold out the ladder. They also come with a backup emergency ceiling button and will even work in a power-cut. 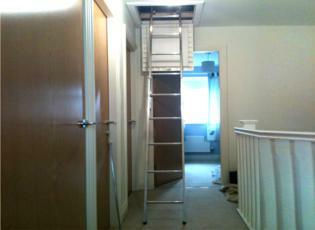 We can install in to any suitable ceiling, enlarge your existing loft opening or install in a new location altogether. Sizes start at around 116cm long and 55cm wide but can be made to suit any size opening and step length. They come with safe-to-climb wide tread steps and have ISA (Intelligent Safety Awareness), so no trapped fingers. Bought a new build house? Been told you can't have loft boarding? NOW YOU CAN!! Bought a new build house? Been told you can't have loft boarding? Now you can have the loft storage you desire, without risking your home owners warranty. Our BBA Approved Products will NOT affect your new home warranty by NHBC or any other. Raised 270mm above your insulation, so no squashing or removal of your loft insulation unlike some other companies do. Strong and safe to walk and store on, far superior than the DIY stilts or loft legs. Three components make up the rigid strong storage sub-frame. Tri-Supports, Uni-Supports and a metal interconnecting cross beam - no other product does this. Any size loft can be done. We are the only LoftZone approved installer in the Northwest. Fully trained, qualified & adequately insured installers. 5 Year guarantee – Made in England – Supported by the Carbon Trust. Normally installed in a day – No mess or inconvenience. FREE no obligation surveys with an instant written quote. We can install with a loft ladder (hatch if required) and a light. Now you can get your loft boarded for storage with our interest free - Easy Payment Plan! Now you can get the loft storage space you want and spread the cost over 3 easy payments! Already had a quote from us? Easy Payment Plan is also available, even if you've had a quote from us in the past. Takes just two minutes to complete over the phone. *This is a deferred payment option over three months with no interest and no credit checks. 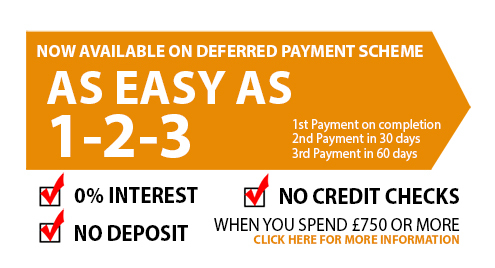 You can pay the balance in full at any time and no deposit is required and no fees to be paid. The only stipulations are that the applicant must be either: - a home owner and in full time employment, self employed or have a retirement pension income and have the means to pay the total amount within the 60 day period. 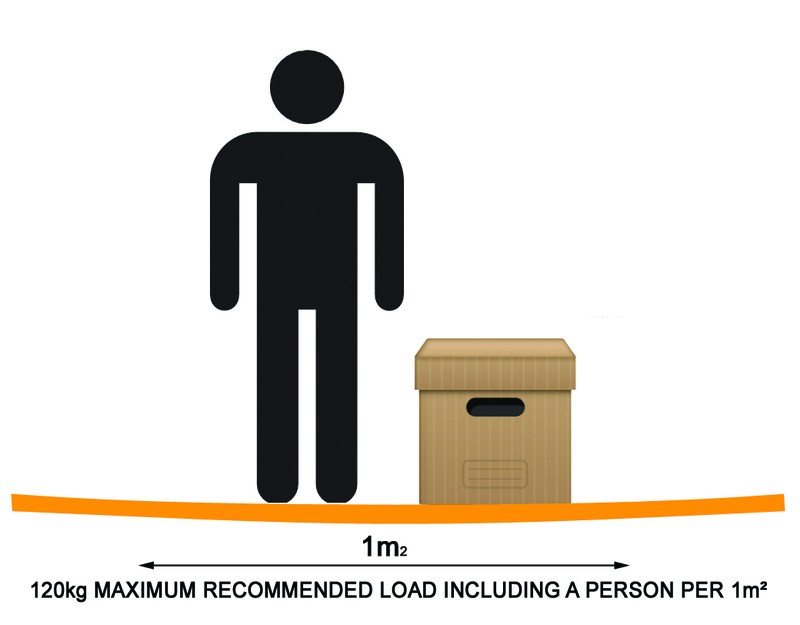 Want loft storage but your builder / developer recommends that you don’t? Do you have a new build house? Want storage but your builder / developer recommends you don’t? Want to know why they recommend you don’t get your loft boarded? This is very common these days, that pretty much all developers / builders of new homes do not recommend you board your loft. So why won’t they recommend boarding out your loft? The answer to this is twofold. Firstly they do not like to recommend any products, tradesmen or service providers for the simple reason, if things go wrong they don’t want the comeback. This I can understand, as they cannot guarantee these tradesmen will be reputable, even if they have been used by others in the past. So they leave it to you to find your own tradesmen / services. I recommend you use a Safe Trader scheme, usually run by your local council by Trading Standards, who have a list of reputable tradesmen in your area. The second reason they don’t want you to board your loft is the fact that there is a lot of insulation in new builds and its very high, so they presume to board a loft the insulation would have to be removed or worse still, squashed. Unfortunately this can be the case with a cowboy builder or DIYer who has no knowledge of building regulations or good building practice. Not too many years ago there was an influx of these “so called joiners” knocking on the doors of new build housing estates and selling cheap loft boarding from as little as £200. What these guys didn’t know, was how to install a safe strong supporting sub-frame to hold the boarding and storage weight. They used to remove the loft insulation and throw in the eaves or worse still they would squash it down so much it popped the plasterboard fixings, and later caused damp and mould issues. So as a result of all this come back on the builders / developers over the years, they have decided not to recommend using your loft for storage. But… There is now a way to safely board your loft for storage, even if you have high insulation levels, without having to remove it or squash it down. 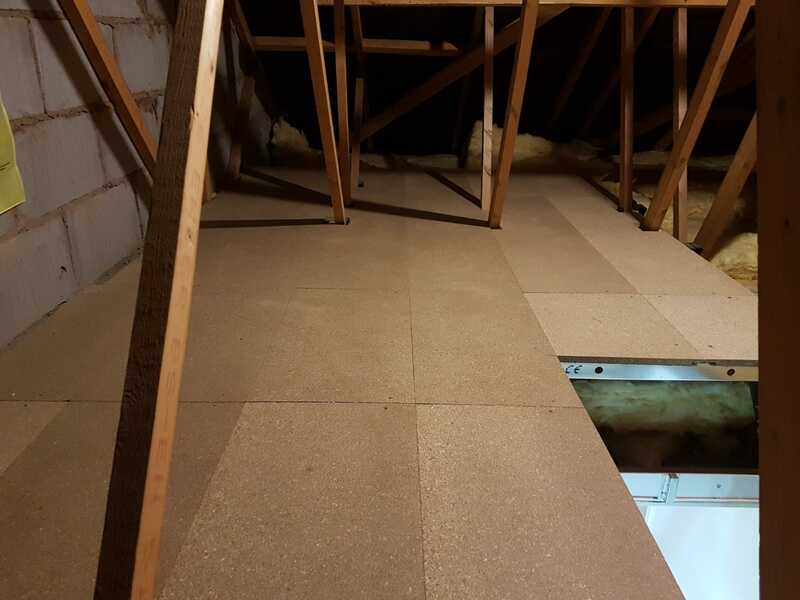 We have a system called LoftZone Raised Loft Floor, which allows a simple but very unique raised platform to be built above the insulation levels of up to 300mm, without any compromise to the existing insulation. This system is supported by the carbon trust, it's energy efficient and is made in the UK. It’s won many awards, including invention of the year at the Ideal Home Exhibition. So now you know there is a product to board a loft in a new build house, why won’t the developers use it? Now the problem is, that the builders / developers still have their blinkers on and even though some are starting to see the light, they still won’t recommend boarding your loft for storage for no other reason, than because of bad boarding in the past. Now this new system has been introduced on to the market and is professionally installed by factory approved and certified installers only, with a five year guarantee. Things are about to change. Oh yes, although the builders / developers will never recommend a trade, having your loft boarded professionally they cannot disagree with as it is all done to a code of practice, is safe and does not affect the loft insulation, cause condensation or weaken your ceiling or roof. Done professionally, you can get storage in your new home without fear of it being done in the wrong way or some poor DIY job someone may charge you an arm and a leg for. FREE surveys and written detailed quotes are always provided for this type of work, for as simple as it may seem, it can't be guessed at. A professional loft survey is always recommended and always given by ourselves. Topped up your loft insulation? What about the old inefficient loft hatch? Replacing an old loft hatch must be done correctly. No point modifying an old push up hatch by reversing it, putting hinges on and a catch without adequate draft seals, insulation and locking points. In some cases it can't be helped as you may want to preserve the look of the ceiling by keeping to traditional wood or finish to match the rest of the house. Although, when done correctly it will be a little more expensive than a new purpose build loft hatch. In most cases, it's not necessary to do this and it's far more cost effective and makes more sense to install a brand new, draft sealed British Standards approved hinged door hatch and frame. This will make a vast difference to your energy bills over the years. In some cases, you can get green deal grants to have this installed for free, but even if you are not eligible for free insulation, it doesn't cost a fortune to buy your own or have installed professionally. Old loft hatches have gaps and they don't seal shut properly, whistle to you on windy days and are pretty much useless to climb through to enable you to fit a ladder or use your loft for storage. 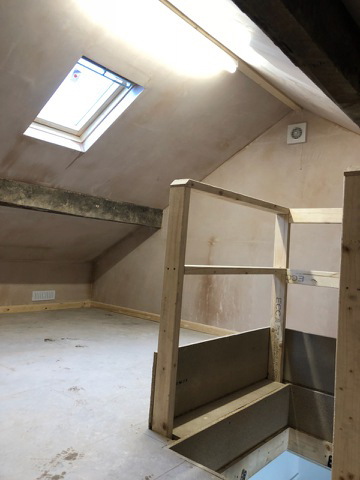 It's important to consider having a brand new, latest specification, draft proof loft hatch installed if you're considering using your loft for storage, as it may need to be done just to get a ladder in. Hand made or reversing the door (Like picture above shows) to convert an old hatch is not recommended, as this will not reach building regulation specifications and is not fully reliable at draft excluding or being energy efficient. Professionally installed, as it can be a pretty big and physically demanding job depending on the age of your property and location of the hatch. You could say the older your house, the more difficult and expensive it can become. But it's still affordable! 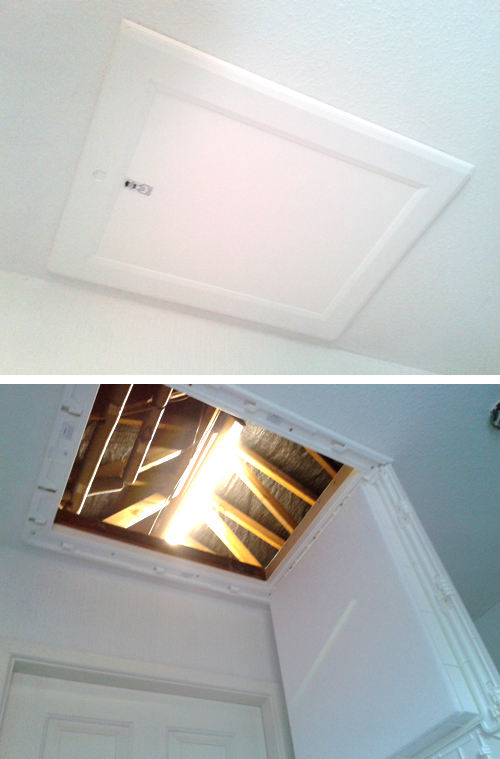 You can get a brand new enlarged loft opening and loft hatch professionally installed from only £90 on average, so it is always worth considering. The Manthorpe GL250 loft hatch that we use has been independently tested by the BRE to BS EN 13141-1:2004, and easily surpasses the requirements for air leakage which are outlined in the current building standards. (Certification is available). The revolutionary design of the multi-point catch mechanism, means that the GL250 door can maintain a more effective air tight seal around the entire accessible opening, helping to meet the air leakage requirements of Part L of the Building Regulations and preventing the problem of moist warm air entering. Many drop down hatches suffer from ‘sagging’ over time. A problem that can cause the middle of the door to bow away from the door seal, creating an air leakage path. To prevent this issue, the GL250 door has 12 independent catch points located around the perimeter of the frame, operated from a single position with a unique sliding mechanism. With the sliding cover replacing a conventional twist action locking mechanism on the door, all of the hinge, catch and fixing geometry has been carefully located outside of the door seal, meaning that there are no holes through the door that could pose an air leakage risk. When the cover is located in the fully closed position, it also completely conceals the hinge detail. The positioning of the doors pivot point is intended to maximise the accessible area available to the user when the door is open, and the pioneering hinge design allows for it to be fully removed from the frame quickly and easily, for simpler installation and better access with larger insulation options. Our expertly trained installers can do most hatch replacements within a day or less, without too much fuss or inconvenience to you and your home. DIY on the other hand! Well, you would need to be very competent to take on this job and you must have good knowledge of general building work to understand what you can cut away and what needs to be strengthened. Cut away the wrong thing and it could weaken your ceiling, which may then collapse if walked upon. If you are not a 5 star DIYer, I wouldn't tackle this job yourself, let the experts do it. When I am out on my rounds surveying lofts for storage, I am often asked a series of questions about my company's ability to do a good job. Obviously, as we are very well set up, we have no problems answering these questions comfortably. Sometimes, I can sense from the initial knock at the door to the walk upstairs to the loft hatch, that there is a bit of tension coming across from some customers. Maybe slightly apprehensively, they are thinking "I am not going to be pressured into anything I don't want". I can understand this feeling; it's what I call the PSS (Pushy Salesman Syndrome). Normally related to dodgy double glazing salesmen and the like. Quite a lot of people in the past have been put under pressure by a pushy salesman, or heard of the likes on TV shows like Cowboy Builders and Watch Dog. To remedy this, I always reassure my potential customers that I do not employ salesmen or use a pushy forceful manner to sell my products and services, because my products and services really do sell themselves. I cover all the NorthWest surveys and quotes, and I tell customers that I am here to give advice and to listen to their requirements and try my best to fulfil them within their budget. In 95 percent of cases, we can give the customer what they want within the budget they have. Sometimes people want more but simply cannot afford to commit to it, so I am always happy to lower the storage area (square metres) to a size that they can afford. It surprises me when I am told how unprofessional other companies are that have already been to quote, if they have turned up at all. They say thank you for turning up (always a good start if you really want work) and they say its good that we really do give actual quotes on a proper headed pad, not a piece of scrap paper or cigarette packet. One person said they had to use their camera phone to take a picture of the prices that were scribbled on the back of a receipt from a builders merchant. They also say we look professional, with our sign written vans, uniforms and all our credentials check out and the websites we run are all very informative. We invest a lot in to our business and staff, with regular training, health and safety, product courses and making sure we conform to regulations as a business. Doing things right cost money, which some companies refuse to spend. Eventually they will fail to succeed. I have been asked to reduce my prices on occasions, as it may have been a little over budget, but I have had to refuse. Purely on the basis that the quality and quantity of materials I use is far superior to other companies, and the only way we can reduce our prices is to cut corners and sacrifice something to do so. I will never cut corners just to compete for a few quid, it simply isn't worth it. 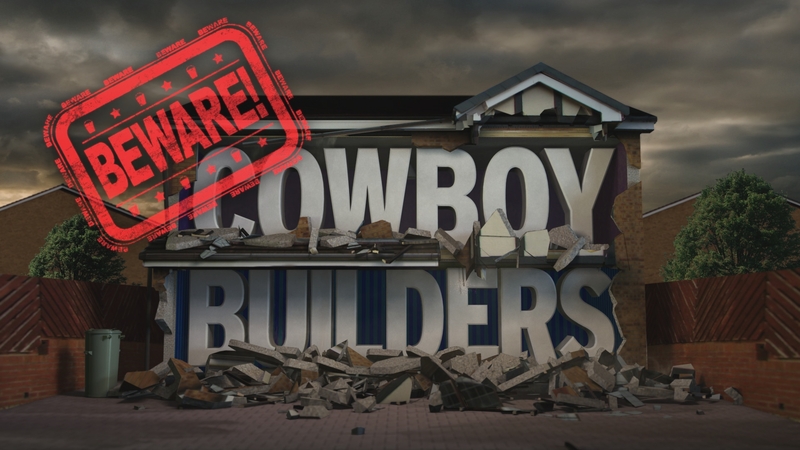 I'd rather lose the job than be caught on Cowboy Builders! This is why my company do regular training with the fitters, and I always mention that they should never cut corners or leave materials out simply to save some time. I would rather pay overtime so they do the job correctly. IS YOUR LOFT CEILING STRONG ENOUGH FOR LOFT STORAGE? I get asked a lot about how strong a ceiling needs to be, or will it be able to take the weight of boarding on the existing ceiling. A ceiling is a ceiling that is all it is meant to be. They were built to hold up the plaster board or lathe plastered ceiling and for the occasional walking on the joists for services reasons. Some older properties, because of the type of roof timbers such as a purling support system or a trussed roof, will make a difference to the overall strength. Older ceilings like a Victorian terraced, tend to have a purling supported roof, which is a big beam from one supporting wall right through to the supporting wall opposite. Some have extra support in the centre, which rests on the internal supporting brick walls so the purlings do not sag over the years. If you have ever had a look inside an older terraced house style loft, you may have seen strips of wood hanging around attached from ceiling to roof? These are known as hangers, and they are there to give extra support (especially in the centre of a bedroom) to prevent the ceiling joists from sagging over the years. Usually 3x2 timber joists run from the back wall under the eaves of the roof to a central wall for support, then from the central wall another set of joists run to the front of the house under the eaves. A lot of older properties suffer from ceiling sag which is normal because the roof may have also sagged but the hangers come loose where the nails have rusted away so they stop bearing weight. These all need to be checked and broken or loose ones need to be replaced with modern timber versions anyway before considering boarding. So will your ceiling take the weight required to board, store and to walk upon? The answer is yes, if done correctly. Adding a batten (2x1 or 2x2) strip of wood is nowhere near any use or support and hardly adds any strength to the existing ceiling. New supporting timbers must be much more substantial than this. Also you can't get hardly any insulation underneath to insulate your home. It’s not rocket science, but some “cowboy builders & joiners” really have no clue. But a specialist will know all there is to know about doing this job correctly. •	Check all ceiling hangers are fixed and not rotten or broken, replace if they are. flow ventilation through the insulation. to be supported without any worries of it damaging your ceiling. boards, ideally in staggered formation if possible without creating waste. nailing can crack ceiling plaster work with the impact. So, if you didn’t do all this preparation work before hand and you simply laid boards on to the existing ceiling without the extra support and strengthening, don't you think you'll be asking for trouble? It will put pressure on the ceiling causing increased sag, and the more weight the worse it will become and eventually it will crack or damage the ceiling beyond a simple repair. And replacing ceiling timbers and plasterboard is very messy and very expensive to do. Worst case scenario is that the ceiling falls through!!! Loft boarding is part of general building, and as simple as it may sound, as a professional company we have to work to building rules and regulations. Building in general is all about making it safe to use and sticking to rules to prevent any weakening of the existing structure. Anyone choosing to ignore these rules should not be in the building profession. SO WHAT ABOUT A NEW PROPERTY WITH A NEW TRUSSED ROOF? Usually the ceiling joists are part of the actual trussed roof frame, so they are already very strong and never really require any added support if the new storage floor system being added is designed to distribute the weight evenly. We use LoftZone StoreFloor which is a unique stilt and beam system, designed to be installed directly to the existing ceiling joists to raise the ceiling floor above the insulation, so as not to squash or remove any existing insulation, which is normally up to 270mm high. Most new loft joist are around 4” to 5” tall allowing room for the first 100mm of insulation to go perfectly in between the joists, then a second 200mm layer laid opposite the first. Being on average 2” thicker and slightly wider than it's predecessor in the Victorian era, this instantly gives the ceiling joists more support to handle modern style loft boarding solutions like the LoftZone StoreFloor system. Normally, as we did with the Victorian house, we only use the central area. In this case, this would be the highest parts down the centre of the loft known as the apex of the roof. Using the eaves can be done, but this restricts access and the pitch of the roof is lower, which also cuts down on the storage height, so you must consider if it is worth using these areas. So how much weight can a new loft take? It can handle a fair bit of weight. But as a rule, if you can't lift it to the loft then that one item is too heavy, so you need to split it up in to different boxes. Total weight is really determined by the strength of the ceiling timbers, extra reinforcement and how well the storage floor is built. Most strengthened ceilings can manage at least two or three people and many storage boxes containing general items, so long as you distribute things evenly throughout the loft then you would be surprised at how much weight can be stored in your loft. For advice on this please ask the surveyor when they do a site survey. They will give you their professional opinion on your type of loft, as to how much storage weight is possible. So what exactly do I need to create a storage area in my loft? If you have never thought about extra home storage in your loft before, then you might want to know what it involves and how much it will cost. The most common questions I get asked will be answered right here. Using your loft for storage isn't a new idea. A small percentage of us have been using our lofts for many years, by placing down old broken down kitchen cupboards and any old lengths of wood we could find. Most DIYers will simply lay them down on the existing joists by removing or squashing the insulation so they can be fastened down. Or worst still, just laying them perched on top of the insulation with good intentions of fastening them down one day. What we didn't know back in the day, was that loft insulation was going to get thicker and taller and require air flow and zero compression to work at 100% efficiency. How times have changed, with thicker insulation, building regulations, government recommended this and that, it's hard to keep up with it all. These days, we can no longer just lay boards on to joists. We have to raise this boarded level higher than the insulation to avoid any compression or worst of all, having to remove what we put down to save on our heating bills. (Gain storage but lose money day after day on rising heating bills). Now you don't have to remove the insulation or squash it, as we have specialist equipment to raise the boarded level above the insulation, so no compression and no removal. Keep your insulation down unsquashed and still save on your heating bills, by using a system called LoftZone Raised Loft StoreFloor. This is a very clever system consisting of 3 components; a tri-support stilt and a uni-support stilt all combined with a steel box section cross beam. All this put together will create a very strong, safe and raised boarded storage area in your loft above the insulation. So what do you need to create a loft storage area? If you have never had a loft made in to a storage area before, then this bit is essential reading. The differences between a new house and an older house can change things slightly, but as a pointer, an older house may need a loft hatch if it doesn't hinge and fold down. It will need to be changed otherwise, and it has to be big enough to get you, a ladder and your things through. 1. Ladders... A fixed stowaway ladder is a must. It not only makes things easier getting in to the loft, but it's also very safe and won't wobble or move like a step ladder. Never balance on a step ladder or use an unsecured ladder to gain access to your loft - a fall can be fatal. A starting point for ladders is a good quality, aluminium, sliding fold away ladder that fixes to the loft floor sub-frame and stows away neatly in to the loft, using a reach pole to push it in. There are various ladders on the market for various jobs, including concertina and wood options. Our surveyor will suggest what is best for your loft. 2. Loft Hatch... You need to get in and out of your loft as easily as possible so the right size is very important. No point squeezing though a tiny hole as you will not get much up there to start with. The standard size today is a 726mm long by 566mm wide plastic draft seal and insulated hinged and folding down loft hatch. a British standard and building regulations accepted hatch used commonly in new build houses throughout the UK. Most new houses over the past 3 years or so will have suitable loft hatches already installed but if its a lift up plastic or wood then it will need to be changed. The reason for this is not just because of the size of the opening its because the ladder wont operate in the hatch if its to narrow and the hatch lid wont lift up enough to get it off because the new ladders sits right above the hatch door. This is not a big job for professionals like us, but could be for a DIYer. 3. Lighting... You have to be able to see what your doing up there so a light is important. Never use a portable electric light that plugs in on your landing socket as these can be lethal if the cable rubs on the metal ladder (which often does). It must be a fixed permanently wired in to the existing lighting circuit. A choice of a bulb or a tube light is available, the tube being a lot brighter than a bulb. Having chosen the correct sub-frame we then install interlocking high density loft panels (or boards) these are specially designed for loft boarding and are of a suitable 18mm thick and very strong when installed correctly. So how much boarding will you need? well that is entirely up to you and your budget and also what will fit. Never completely board your loft out as it is a loft space and it needs air circulation to work so keep the eaves free at least. So that is it really, unless you want safety rails, roof dust sheets or a mini loft conversion (luxury loft room) there is nothing else to consider. These are only examples and vary depending on the amount of boarding you need. Last week I removed some loft boards - guess what I found underneath?! I was asked to survey a loft last week by a customer who wanted a new loft hatch and some additional boarding. They already had some boarding done three years ago, by another company. We always try to fulfil customers requests, but I did mention that the existing boarding would have to be up to scratch for us to be able to build next to or attach onto, in some way. There could be a height difference, as the way we do it we always raise our loft floors above the insulation with an air gap, and in my experience not many companies actually care about this and either remove or squash insulation down. 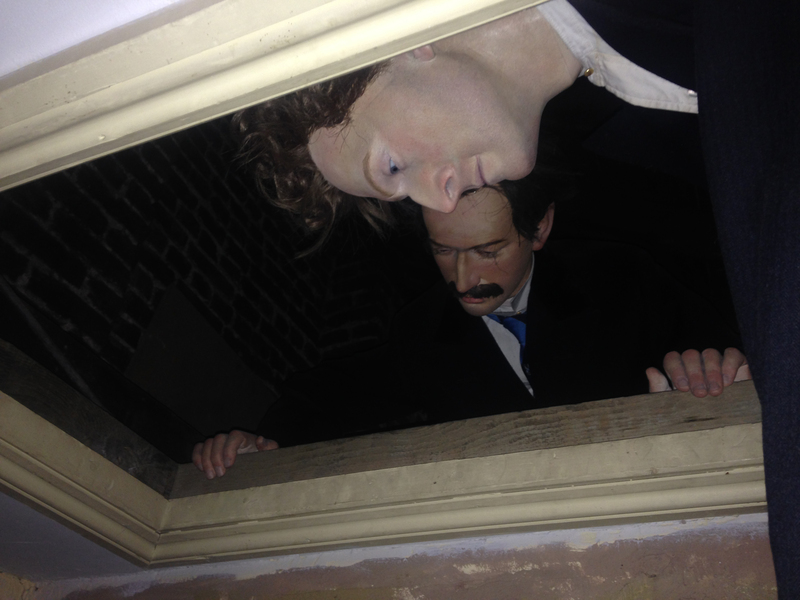 I arrived at the house and was greeted by a nice couple who guided me upstairs to the tiny old wood hatch. As I looked up I noticed the hatch was not going to be right for the job as it needed to be bigger and hinged downwards so you can access the ladder and be able to use it safely and correctly. I climbed in to the loft and immediately noticed the existing boarding. "Oh dear", I said as I glanced at the nailed down boards attached to the existing joists. I explained to the customer what I was looking at, and I asked them if they had ever noticed a funny smell up there. The husband said he had when he had been in the loft. "Smells like damp", I said. "Yes, that's it" the customer replied. I asked if I could remove some boards to investigate, which I did and I found that the underside of the boards had black mould spots and the insulation was damp and also mouldy and it stunk. This had been caused by not leaving an air gap underneath the boards, and the boards had been compressing the insulation so much it couldn't breath. It's efficiency was very poor also, so instead of collecting air as it circulated, it was like a sponge collecting moisture instead. The solution was to remove all the old mouldy boarding and the mouldy insulation and replace with some new 200mm rock wool insulation. Then to create a raised boarded storage area over the top of the insulation allowing an air gap for circulation, making a total height of 270mm. As I always say, anyone can board a loft for storage but it's how it's boarded that matters. You must always allow room under the boarding for air to flow. This allows good loft air circulation, preventing damp and condensation and for your insulation to work at its most efficient. The combination of all of these things will save you money on your fuel bills when its done right. I have seen incorrect boarding time and time again. I advise you to get an expert loft storage company in that knows what they are doing. See what sort of products they use to raise up a storage floor, if they even bother. Sometimes, just a bit of battening is no where near enough height to allow good air circulation under the boards. The only product we would recommend and use is the LoftZone 270mm high raised loft floor solutions. BEWARE! Dodgy loft boarders may be in your area once again! I am concerned that a few of our new customers have expressed this to us before choosing us to do the work. Something I wasn't aware of until now, is that some loft boarding companies are going around quoting for work then passing it on to another company or contractor to do, without advising the customer who will be doing the work. It was only because of a few vigilant customers that this was discovered. When phoning the company back to ask who would be installing the boarding, they were being told it was another company who would be doing it, but would not say who or give any contact details!!! This to me is just not good practice. If the company you call to quote doesn't actually do the work, then you as the customer should be informed and it should be clearly stated in writing on the quote with all the facts attached!!! But who are these contractors? Are they odd job men? Are they qualified? Approved? Insured? A guy down the pub? Who guarantees their work? Not only that, I have also heard jobs being passed on down the line to 3 or 4 so called installers before one of them chose the work! Hmmm... maybe it's down to who provides the cheapest quote? This is a disaster just waiting to happen to someone. I would advise anyone who has any doubts to get the quote on a proper letter headed quote, with full address, land-line phone number and VAT registration number if applicable. Also when getting a quote, ask questions about the company. Such as - do you employ your own installers? Are they trained, qualified, accessed, approved, certified, insured etc? If the answer to any of these questions is NO, then think twice about who they are. Are they a real business or just in it for the money until they get caught? Here today gone tomorrow! With no contact details, or guarantee. Please check out any company beyond questions. If they are of any good standing within the building world, they will be registered with some authority like Safe Trader, which is run by Lancashire County Council Trading Standards. Not the likes of Rated People, My Builder etc. Unfortunately, these companies only sell leads to contractors, they don't access the companies work portfolio or carry out credibility checks. Even the feedback they have can be fraudulently made up. Ask for references from others who have had work done, even ask to speak to existing customers. We always have customers who are willing to vouch for us. Loft Boarding NW answer YES to all the questions above and we are a member of LCC Safe Trader, who keep a check on what we do and how we do it 24/7. We only employ our own certified approved and trained installers, and we give a 5 year guarantee on the equipment we install. Remember: Anyone can install loft boarding, but it's how it's installed that really matters. Please be vigilant and keep a look out, there are cowboys and fly-by-nights in every trade. In most cases if your rent a property, privately or through a social housing scheme, you will definitely require written permission before any work can go ahead. In some cases the landlord or association may require a full breakdown from us of what you intend to have done and for what purpose. Unfortunately there is no way around this, as it would be breaking your tenancy with your landlord or association for failing to inform them of the intended work (classed as building work), and they will demand it to be removed at your expense. If you are renting a property its always best to seek advice from your landlord/association before going ahead, a simple letter of consent from them is all we require so we can proceed and give them the desired information (copy of quotes and survey) if required. 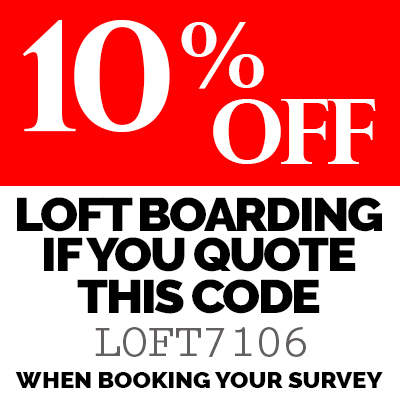 Once we have approval, we will then proceed with a survey and to install your loft boarding solution. Please be aware that not informing your landlord or association of intended work in your loft could be seen as a breech of your tenancy agreement and may have serious consequences. Condensation in the loft? Why do I get it? How do I prevent it? Winter is the time of year when the temperatures can suddenly drop dramatically and rise quickly due to the sun coming out. The sudden change in the weather means our loft spaces start to get colder, and the immediate heat generated by the sun hitting the roof will generate warm air quickly before the loft space has adjusted to it. Warm air contains moisture, so warm air plus cold surface equals condensation! 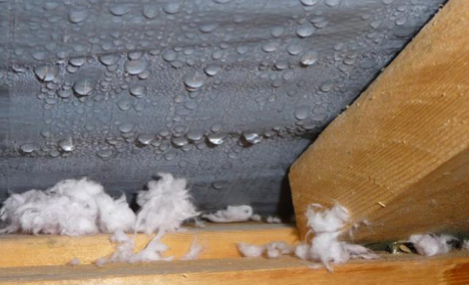 Moisture can form on the underside of the roof felt/membrane/wood to form droplets of water. This is especially common with older houses, but can also be present in newer properties. So what is the cause? Well, some percentage of warm air hitting a cold surface is to blame, so make sure your loft is well insulated (government recommended level is 270mm). Check you have a quality draft sealed and insulated loft hatch. If you have an old wood one, check the seal is tight and make sure there is insulation on top of it. It's best to have it replaced with a modern one though, as the old ones tend to leak badly, letting warm air in to your loft. No point having loads of insulation, when the heat is seeping out through your hatch. Check for any old holes left in ceilings and walls by workmen, where old pipes/cables used to be and seal these up. Never block the eaves of your loft as this will stop vital air circulation. The biggest culprit for condensation is the lack of air circulation. Fit some soffit vents or slate/tile vents and clear the eaves so air can flow correctly. DO NOT board directly on to your ceiling joists and DO NOT squash your insulation to board for storage. This will cause or add to the problem, as well as reducing the efficiency of your insulation by up to 50% or more. The best way to get around this so you can add some loft boarding, is to install a raised storage area at least 50mm clear of the top of the insulation level, so that air can circulate around and underneath the boarded area without being restricted. It's best to use a raised loft floor system like LoftZone Raised Loft Floor to do this job correctly and professionally, or you can use a timber trussed raised sub-frame if the LoftZone system is not suitable. Also, look for other heat generating appliances in your loft, such as unlagged hot pipes from boilers etc. Add more soffit vents, wall or roof vents to help create air flow, unblock the eaves & check the seal on your loft hatch. 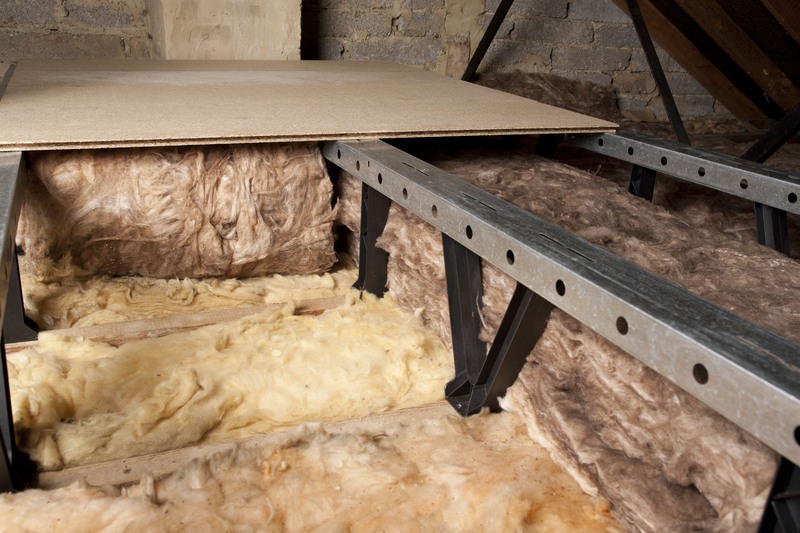 If your loft is already boarded, check to see if it squashing your insulation. There should be at least 50mm above the insulation of clear space. Some simple checks could solve this problem. In some small cases it could simply be bad design, but it is more commonly blocked soffit & air vents or suffocating loft insulation. 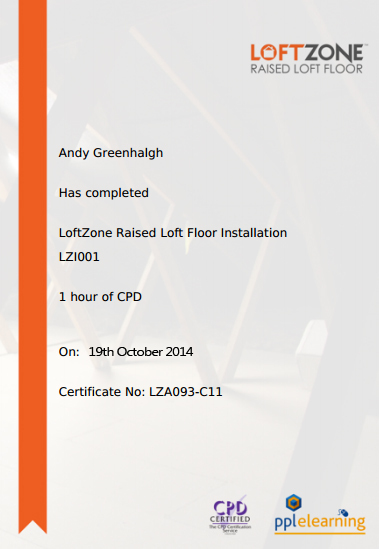 LoftZone Raised Loft Floor - We are now certified installers on the new installer course! As well as being an approved installer of the LoftZone StoreFloor products, we are now certified installers, as we have just completed the online CPD certified LoftZone installers course. 100% score as expected from Andy Greenhalgh, our boss! As a professional company, we always strive to improve and better our knowledge in our industry, because we want to be the market leaders and the best at what we do. Only those who put in the time and effort to do this will succeed in this ever growing industry. Thanks to PPL training for the course and Dave at LoftZone for designing such an informative and straight forward course. Onwards and upwards as we continue to grow from strength to strength. Warning about bogus and cowboy loft boarding companies in your area! Quite recently, I have been receiving a lot of emails from people who have problems or complaints about other companies who have been boarding lofts. Their main concern is that they feel they have not had their lofts boarded correctly or safely, because they have seen the information and examples on our website. From investigating this information, I have found that there are a small group of people passing themselves off as a loft boarding company, who are using cheap materials and cutting corners to give competitive quotes. The quality of workmanship is not even equal to poor DIY standard. Cheap materials and insufficient support will lead to an unsafe loft. They will probably be uninsured and have no after sales service or guarantee, they will probably only advertise or give you a mobile number and not issue a genuine printed receipt with the company details on. We install loft boarding professionally, safely and using the right materials and the right quantity of materials to do the job safely and correctly. We do not compromise on the materials quality or quantity, simply to compete on price. We also give you a 5 year guarantee and carry full PLI ELI insurance and are members of LCC Trading Standards Safe Trader Scheme and Help Direct. 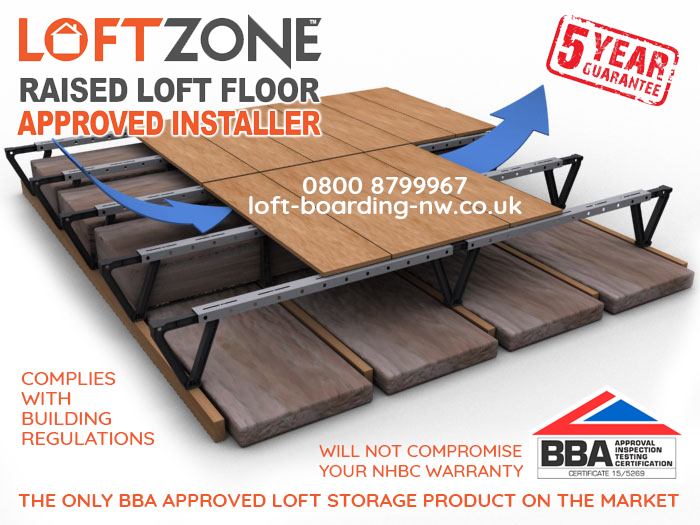 We are factory approved, qualified and trained to install LoftZone StoreFloor loft boarding system. What not to do if you plan on boarding your loft for storage! The biggest mistake made when boarding out a loft, is boarding directly on to your existing ceiling joists. In most cases, to do this you have to remove or crush your insulation. DO NOT do this!! To do it right, you must use a raised sub-frame to create an air space under the loft boarding and above the insulation to allow air to circulate underneath. This will allow your insulation to continue to work 100% efficiently and prevent condensation build up. Not doing this will reduce your insulation's thermal efficiency by 50% or upto 100% if you remove it. There are still companies that don't build raised sub-frames before boarding. This was the method used before the days of insulation. The reason is clear why some companies are still not doing this. By leaving out a sub-frame, it will keep down the costs and therefore they will be more competitive, simply because the consumer does not know the effects of not using a raised sub-frame. So whoever you choose to board out your loft, make sure they are using a raised sub-frame that allows your insulation to breathe. We are soon going to be introducing some great new loft storage ideas, to make things even easier for you to gain access and use your loft space for storage. Coming soon are our new fully automated loft hatches, balustrades and hand & grab rails. 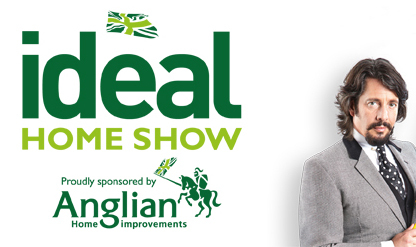 Ideal Home Show a huge success! Held at EventCity in Manchester, the show had an amazing turnout somewhere in the regions of 10 to 13 thousand people a day over the weekend. A little bit of traffic chaos, but it was well worth the wait. The place was huge and there was something for everyone. Nice to meet and demonstrate to so many people who came to our stand. It was very busy and none stop all day. we were tired and aching, but it was well worth it. Thank you all who came to see us, and hope to see you all again next time at the Ideal Home Show. The lucky competition winner for the £300 storage solution will be drawn today 9/6/14 and be announced on this news page. For the first time in its 106 year history, the iconic Ideal Home Show will be welcoming visitors from across the North through its doors at EventCity Manchester. Split into seven dedicated show areas, from Interiors to Home Improvements, Food & Housewares to Technology, Gardens, Women and Shopping. The show gives you the chance to explore thousands of products, exclusive show offers and items you won't find on the high street. Loft Boarding NW along side LoftZone will be standing at the show on stand H452. You are all welcome to come and visit us, to have a chat about loft storage and what our solutions can do to solve your storage problems. 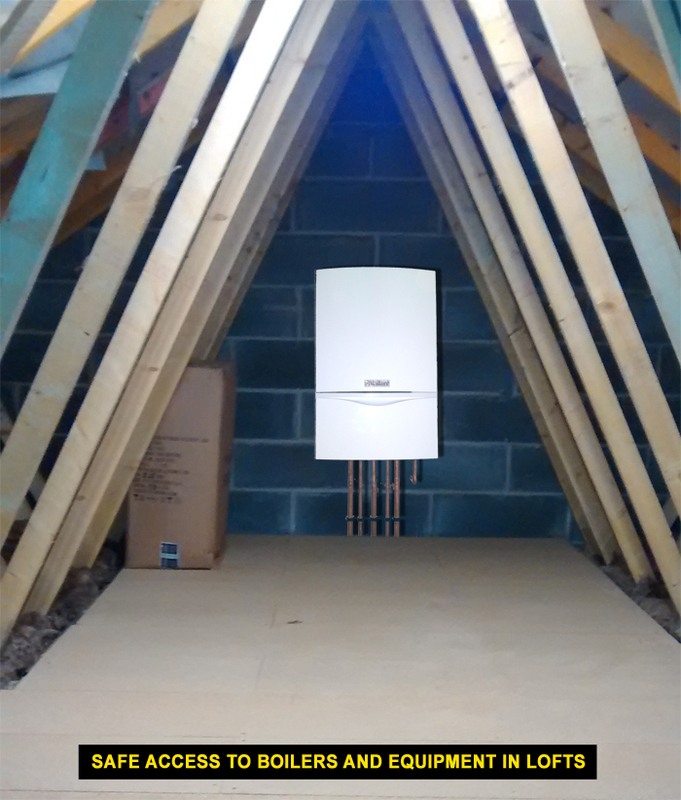 Are you considering having your boiler moved or installed in your loft? You may have been told that you must provide access for the engineer, so he can install the boiler and service it. By law, these new rules must also include the installation of a fixed fold away ladder, building regulation sized loft hatch, grab / safety rail near the hatch area, secure & safe boarding platform with sub-frame from the hatch to the boiler and adequate fixed lighting. 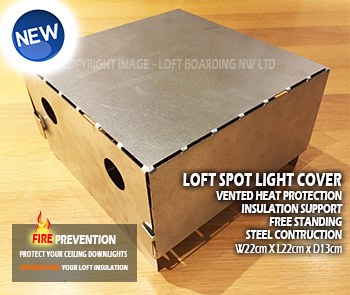 Loft boarding NW now provide a bespoke system of store floor, which will work for any loft with high loft insulation. This will avoid any loft insulation compression, which would reduce its efficiency. 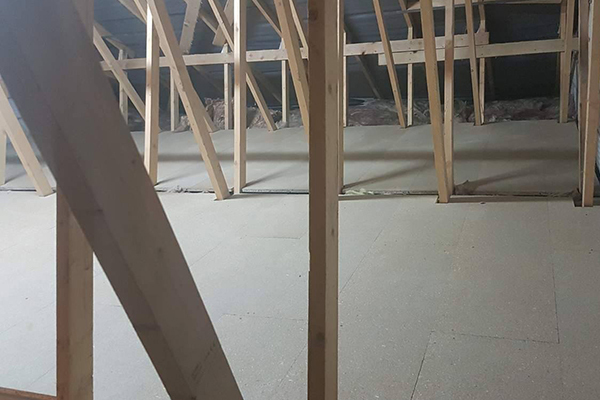 The cheapest and simplest solution to the very common problem of storing items in a fully insulated loft, is to install a raised floor above the insulation. The LoftZone StoreFloor is a lightweight, low-cost, easy-to-install and very strong platform for storing items and walking. All whilst protecting the 270mm loft insulation and allowing it to save energy and cut fuel bills as intended.